Since 2011 the Chester Historical Society has been supporting and working with a Borough and Township project team to create the “Integrated Trails Ecosystem Plan for Chester”, popularly known as “Chester Trails”. Historic sites which cluster around downtown and dot the countryside are an important part of the trails ecosystem which permeates Chester. Just as a hiker, walker, or biker enjoys the natural environment, we felt it was important for them to enjoy our historic heritage. Using previous Historical Society publications, 60 historical sites were selected for inclusion in the Chester Trails Plan. Choosing the 60 was hard, but this is just the first selection. Hopefully we will continue to add more. We have put the 60 sites on a PowerPoint presentation, the Chester History Tour, which will be the subject of a future CHS program. Each of the 60 sites on the CHS Auto and Walking Tour has at least one recent picture of the site, background and historical information. 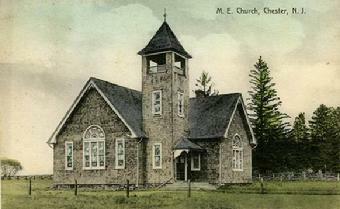 One example is the Methodist Church which we can appreciate even if it burned down in 1921. Using a picture from the CHS archives, we can still tell its story and provide a sense of place, even if it is only a memory. Using the Chester History Tour, Jon Wagar (Conservation Resources Inc.) has kindly created a “Chester History Trail” that is available online. If you have a smart phone that is web enabled you can access the tour including maps, pictures, and descriptions as you walk from site to site. 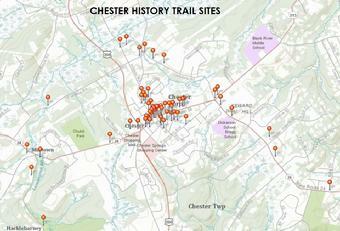 Click here to access the Chester History Trails website.